Pennsylvania requires a license to carry any gun. The right to bear arms is protected by the United States Constitution's Second Amendment. If you want to carry a concealed firearm, however, most states require a special permit to do so. 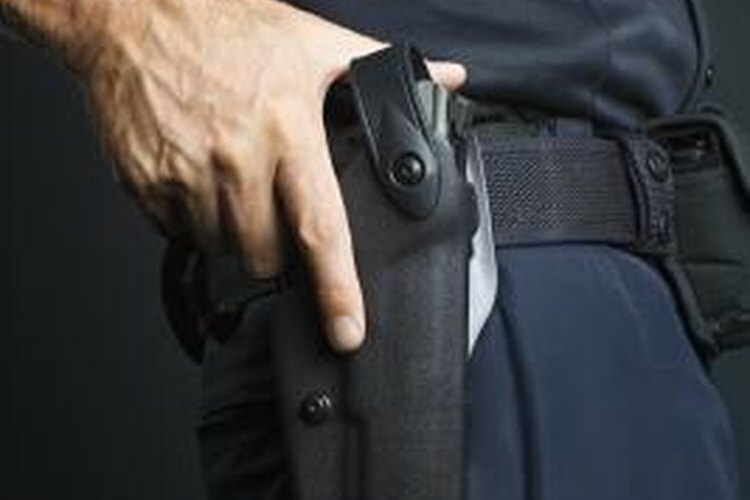 Under the law, concealing a gun extends to carrying a handgun in a pocket, under a coat or in a bag or a purse. If you reside in the state of Pennsylvania, getting a license to carry a firearm is not difficult and most people are approved. Visit your local county sheriff's office and obtain an application. While anyone can pick up the form, you must personally hand in the completed application as part of the process. Fill in the application form completely with identifying information including your name, your date of birth, your height and weight, and your hair and eye color. Include your address and telephone number and the reason you want the license. Write on the application form the names, addresses and phone numbers of two people who will serve as references for you. These people cannot be family members. Fill in the reference fields completely, because your application will not be processed without them. Answer several personal questions, either in writing or in a personal interview, depending on the county's rules. You may be asked if you have ever been convicted of a crime, if you have been involuntarily committed for a mental condition and so on. Answering yes to any of these questions does not automatically disqualify you for a license to carry, so answer truthfully. Provide a copy of your photo driver's license or a state-issued photo identification card, as well as your social security number. This information will be used by the sheriff to conduct a background check on you. Photo identification is a requirement. Sign and date the application in front of a deputy sheriff, who may take your photo as well. Wait for the license to be mailed to you. You will not receive it at the time you fill out the application. After the sheriff's office runs a background check, the state will have to approve the application before you can receive your license. If you are rejected, the sheriff will send you a letter and information on how to file an appeal. Your License is only good in the state in which you applied. If you are planning to go to another state, for vacation or hunting, etc, and wish to carry your firearm along for sport or safety, you will need a permit for EACH STATE that you travel through to get to your destination. Some states have a reciprocity agreement with Pennsylvania, which means if you have a permit in PA, maybe Florida (just an example) will accept that and allow you to carry concealed in their state without actually having a concealed license from Florida BUT...maybe the states you travel through on your way to Florida do not, and you will be in violation in those state. You may want to check with the sheriff of any state you wish to visit or travel through for a reciprocity agreement. If you possess a license to carry, and knowingly become ineligible, you must notify the sheriff of the county in which you reside and your permit may be revoked.